As I begin to write this, on the first day of 2010, my plane is dropping from its cruising altitude to start its descent into San Francisco SFO. (Kind of gives new meaning to the term “Cloud Computing” I suppose.) And here we go: the Noughties are over and we have arrived in the Teens. One big question seems to be: Do we call this year “Twenty Ten” or “Two Thousand Ten”? “Twenty Ten” sounds pretty nice. Or “Two-K-Ten”. How about that? Or just “Ten”. It’s all about the sound, right? Ten can be good. Need’s context, though. Everything needs context, I suppose. And what’s going on in Ten? For me, a lot! For one thing, I’m working very hard on my new, multi-disciplinary work Baggage Allowance. It is being realized in three configurations: First a solo gallery exhibition of media installations, which will open at the end of this month (!) at the Krannert Museum in Illinois. Then as a multi-media performance work which will have a bi-coastal premiere at Theater Artaud in San Francisco (May) and at The Kitchen in New York (September). And finally, as an ongoing, interactive web portal, which will go live at a yet-to-be-determined date in 2010 via those tubes and wires we have all come to know as the World Wide Web. I had a solo gallery exhibition called Parts of Speech at the University Art Museum in Chico, CA. The installation included a 4-channel audio work with speakers mounted on small, cloth-bound grammar books, several 2-channel audio pieces, a work for three tape-loops and video, and a work for a single split channel of video with stereo sound. I received Rockefeller funding (through the MAP Fund in NY) for my Baggage Allowance project, and I had a work performed at the Juilliard School in New York as part of a festival celebrating California composers. I participated (both as an organizer and an artist) in the 10th Annual San Francisco Electronic Music Festival, and I had numerous touring engagements in the US. I also made several trips to Europe for a performance at YUXTAPOSICIONES '09 Microfestival in Madrid, an Ars Electronica jury, and to attend Ars Electronica and the Venice Biennale. 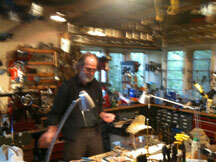 While in Seattle for a performance and lecture, I visited Trimpin in his marvelous studio and he was full of great suggestions and advice for my upcoming gallery installation work. 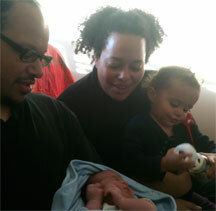 And, as a miraculous finale for the year, my new niece, Asha Jane Marcus, was born to my brother Jeremiah and his wife Anna (who I never tire of referring to as my “sister-out-law”), and the happy event led to a heart-warming New York family reunion! 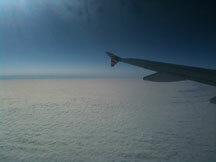 New Year's Day cloud cover out my Virgin America flight window. 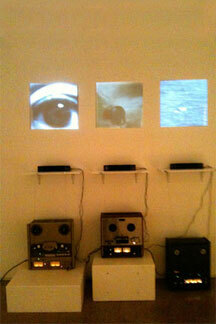 Eye Can Sea (tape loop & video piece) from Parts of Speech installation. 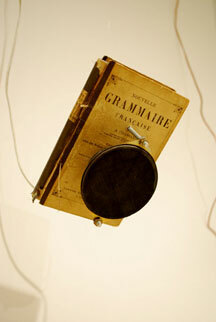 One of four speakers mounted on grammer books in PZ's Parts of Speech installation. To Celebrate their 75th Anniversary, SFMoMA invited 75 artists to each give a 7.5-minute talk about a work of their choice from the museum�s collection. Pamela Z�s talk (about a Robert Rauchenberg piece) will occur at 5:30pm on Saturday January 16th. Pamela Z gives a solo concert of works for voice and electronics followed by a question/answer session. The event is free and open to the public. Pamela Z performs as part of an ensemble with Vijay Iyer, Mike Ladd, Okkyung Lee, Guillermo Brown, and Liberty Ellman performing new work by Iyer and Ladd. Beth Custer (Clarinets) Matt Ingalls (Clarinet & Electronics) Cornelius Boots (Bass Clarinet) Each clarinetist will do a solo set and/or duo with Pamela Z, and then Pamela will join all of them in an ensemble finale. Pamela Z gives a solo concert of works for voice, electronics, and video as part of a festival that also features AGJ, Gurdrun Gut, Joelle Leandre, Laetitia Sonami, Christina Kubisch, Pauline Oliveros, and more. ODC Dance presents a new work called "Waving Not Drowning (A Guide to Elegance)" choreographed by director Brenda Way with a commissioned score by Pamela Z in its world premiere at YBCA's Novellus Theatre as part of the ODC Dance Downtown 2010 Season. 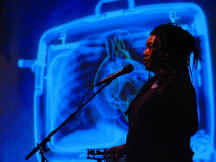 Pamela Z gives a solo concert of works for voice & electronics at the end of a month of events curated by Larry Ochs at The Stone as part of Ochs' “Word + Music Series”. 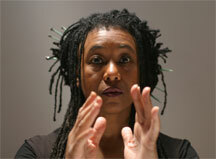 Pamela Z gives a solo concert of works for voice & electronics as part of the IUPUI Interarts Festival.